Back in the days before Facebook was popular, there was this service called Livejournal. When someone’s birthday came around, you would do a post wishing them “Happy Birthday”. I thought that was too simple, and wanted to sing a birthday song. 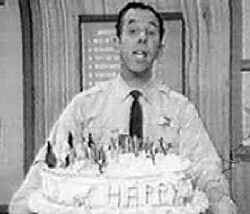 Now, I absolutely detest “Happy Birthday to You”, preferring instead the song that was song in my childhood in Los Angeles: that is, the “Birthday Cake Polka” (i.e., “put another candle on your birthday cake“) as sung by Sheriff John Rovack, a children’s TV host on Channel 11. That quickly turned into a poll asking people their favorite birthday song, which was first posted in 2005. Over the years, Livejournal has declined in popularity; it has been eclipsed by Facebook. Yet I still give birthday songs. Without the poll, it has just devolved into singing the Birthday Cake Polka. Recently, I’ve decided to revive the goal of providing a song of your choice. Click here to see the song choices others have made; comment on that page to make your song selection. This is the place to comment if you want a birthday song on Livejournal, Facebook, or Dreamwidth (the indicated service needs to send or provide me with a birthday reminder). Just indicate the song, the service, your username (if the last two are supplied by your signin), and if necessary, the month and day of birth. Note: You need to be demonstrably active (i.e., making posts that I can see) on the service to get a birthday song. If you are on multiple services, you get one song, in the priority order: Facebook, Livejournal, Dreamwidth. (posted on Facebook): David Elliott Bell commented on his Wall post. Greg Skinner: Stevie Wonder’s “Happy Birthday” works for me. Thanks! I like Yom Huledet and my birthday is in less than 2 weeks (2/11). I’mma change things up. Let’s go with Older by TMBG.